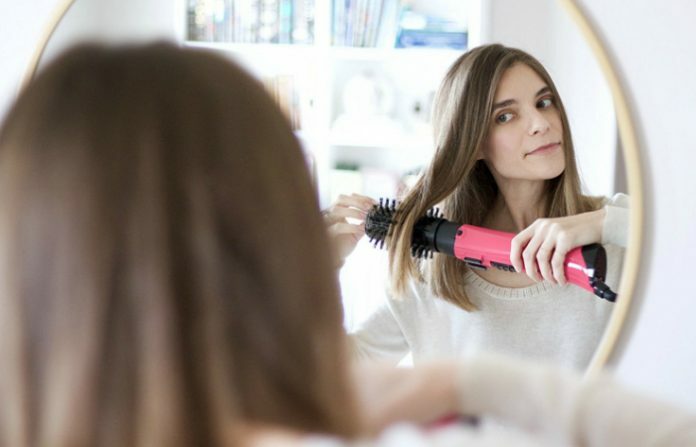 If you’re always using a hairdryer so you can style your hair afterward, why not do it at the same time with a multipurpose tool? In general, hot air brushes function like hairdryers to dry your hair fast. However, what sets them apart from hairdryers is that their design is made for quick styling. They’re the innovative version of round brushes. If a hot air brush has an automatic rotation feature, it gets even better since it becomes more versatile in creating different hairstyles. That’s why we’re recommending rotating hot air brushes. If you want more curls on your hair, you have to get your hands on Conair Infiniti Pro Rotating Hot Air Brush. It is effective in creating natural waves and curls to make your hair look even thicker. This product can also make your hair shinier and healthier because of its ceramic components. It dries your hair without eliminating natural oil. It also releases a lot of concentrated ions to prevent damaged hair. In case you’ll prefer a regular hot air brush sometime in the future, you may turn off this product’s spin function. Additionally, if you’ll activate its Cool Setting, this brush will not get hot. Lastly, you should know that most users of rotating hot air brushes complain about tangles. 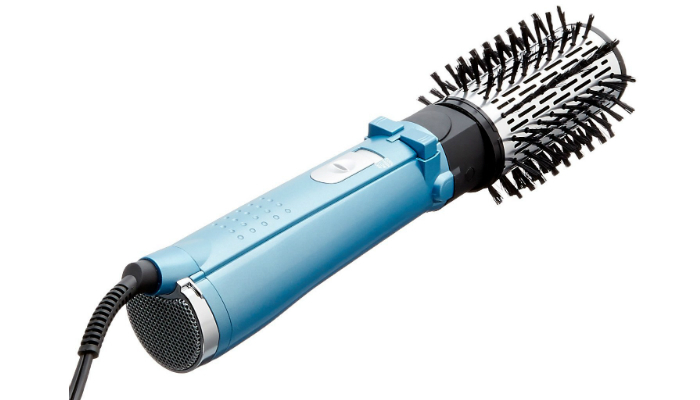 Fortunately, this one has anti-static bristles that won’t tangle your hair. It is ideal for all hair types, no matter how dry or thick your hair is. With BaBylissPRO Spin Air Brush, you may easily reverse the direction of its rotating barrel. This guarantees more shine, volume, and bounce on your hair. If you’re frequently changing your hairstyle, this product will be very helpful. It can adapt to your changing preferences because of its versatile functions. It also has a solid, tough construction so it can last longer. Because of Revlon Spin Air Brush’s smart design to retain enough moisture, your hair will have that healthy, natural shine. It uses Ceramic Tourmaline Technology with 900 watts of power. This product has two heat settings to make your hairstyle last for the whole day. Using it feels like a professional hairstylist is helping you every day. MILUSH USA Rotating Hot Air Brush highlights another function besides hair drying and styling. It is also considered as a “volumizer.” Its multi-directional two-speed rotation gives volume from the roots to the tips with total dependence to your control. Your hair will be super-smooth to touch because of this product’s soft bristles. 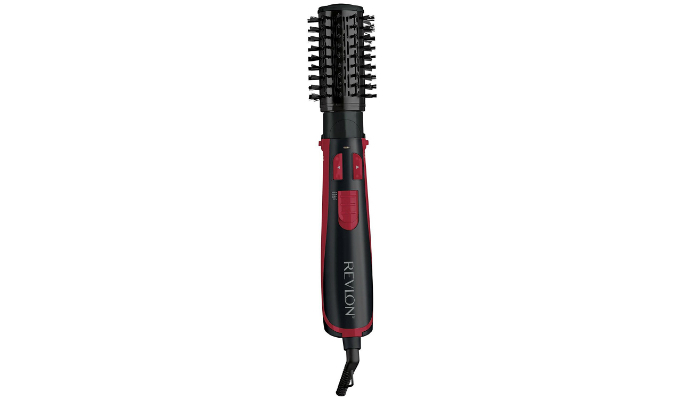 The brush’s tourmaline ionic technology will prevent frizz. It also has a big barrel to give you full curls. 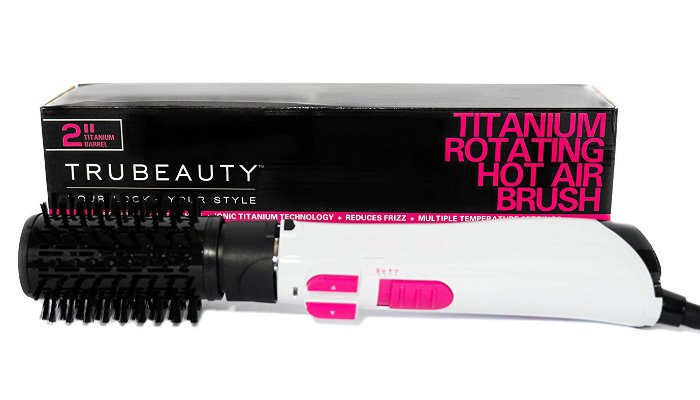 With its Nano Titanium Technology, Tru Beauty Rotating Hot Air Brush combines ions and heat to safely dry your hair. 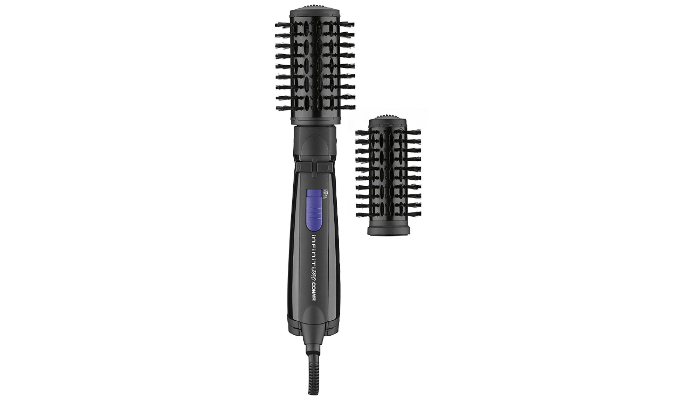 It has three temperature settings for versatility when it comes to hair types and styles. This product is very convenient. Its handle improves your grip while keeping your hand comfortable. Meanwhile, the swivel cord is long and tangle-free to keep you focused during the styling process. Sometimes, a hot air brush should have a rotating barrel so it can give you more volume through curls or waves. The result is a salon-quality hairstyle. Unfortunately, not everyone knows how to use the rotation feature. Many users ultimately consider their rotating hot air brush useless since they always tangle their hair. Meanwhile, others find it time-consuming to use the rotating barrel all the time. That’s why we think it’s best if a hot air brush has an off switch for its rotation feature. That way, even if you’ll give up with the rotating mechanism, you can still use the product as a regular air brush. We don’t want you to waste money. Just a quick tip to help you avoid tangling your hair with a rotating air brush – surrender to it! You’re most likely to control the brush’s movement but leave it alone. Just position the brush based on your preference and let it rotate to style your hair. We’re aware that people with short or thin hair might not get used to overly big brush barrels. The air brush will just comb through their hair. The standard for all hair types is a two-inch barrel. It gives smaller curls, but at least you’ll get to use it even if you’ll decide to cut your hair short. Small curls might look unnatural for long hair, but it’s up to you to adjust the setting to turn distinct curls into natural-looking waves. A rotating hot air brush is worth the money if it is extremely versatile. To ensure versatility when we talk about hair styling, it should have the basic settings. We’re talking about speed, temperature, and direction settings. Speed setting is useful to adapt to your handling. If you’re not used to fast rotation, the speed setting can provide you slower movement. On the other hand, if you can handle the rush, feel free to adjust the rotation to a higher speed. Meanwhile, temperature setting is important for hair styling. Strong curls and hair straightening need more heat while mild waves and volume enhancement respond better with warmth. Lastly, the direction setting contributes to easier hair styling and handling. Multi-directional air brushes give better curls. You may also untangle your hair quickly if your brush can rotate to another direction. The best rotating hot air brush should have an off switch, a versatile size, and a helpful set of modes or adjustments. That’s why we selected Conair Infiniti Pro Rotating Hot Air Brush. How to Sow a Button?